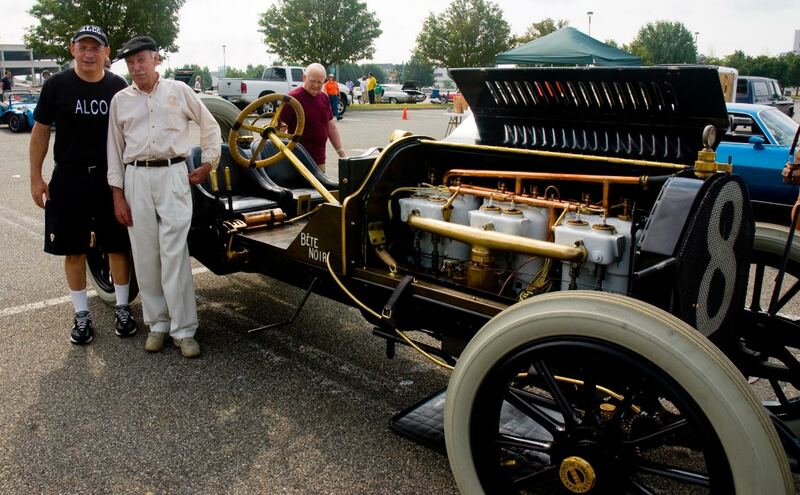 From 2004 to 2010, Guy organized successful centennial celebrations of the Vanderbilt Cup Races in Garden City and Roslyn Harbor. 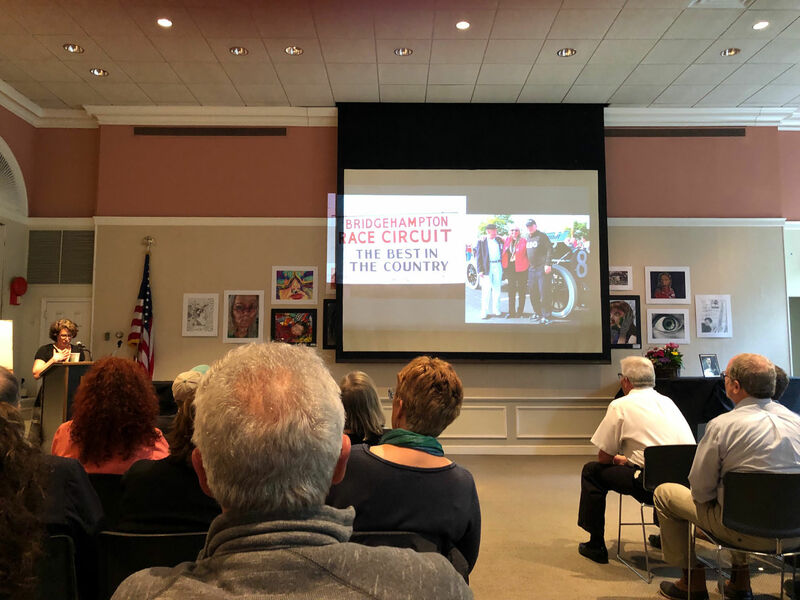 It was an honor for me to assist Guy on these celebrations and serve with him for six years on North Hempstead's Historic Landmarks Preservation Commission. Guy will be missed, but never forgotten. It is with great sadness that the family of Guy Ladd Frost announces his passing on Thursday, March 14 at the age of 85. Architect, preservationist and motorsports enthusiast, Guy Ladd Frost was born on January 17, 1934 in Brooklyn, New York to Rose and Stanley Frost. He served as an Aircraft Controller in the U.S. Air Force from 1954-1958, stationed in Japan and later in Montauk, Long Island. In 1958 he enrolled in the architecture program at Rhode Island School of Design, where he met his wife, Donna Dussault. The two married on Memorial Day, 1959. Guy and Donna purchased a home in Roslyn in 1965, where Guy was taken under the wing of master preservationist, Admiral Roger Gerry. Together they worked for 25 years restoring the more than 50 structures in Roslyn's Historic District, including the Ellen E. Ward Clock Tower. The Frosts purchased a home in East Hampton in 1973 and Guy pursued his love of motorsports at the nearby Bridgehampton Race Circuit. He dedicated over 25 years of his life to the preservation of the track and Long Island's rich motorsports history. Guy is survived by Donna, his wife of 59 years, and three children Erica (Ronald) French, Christopher (Kimberle) Frost and Jessica Frost, as well as his five grandchildren. 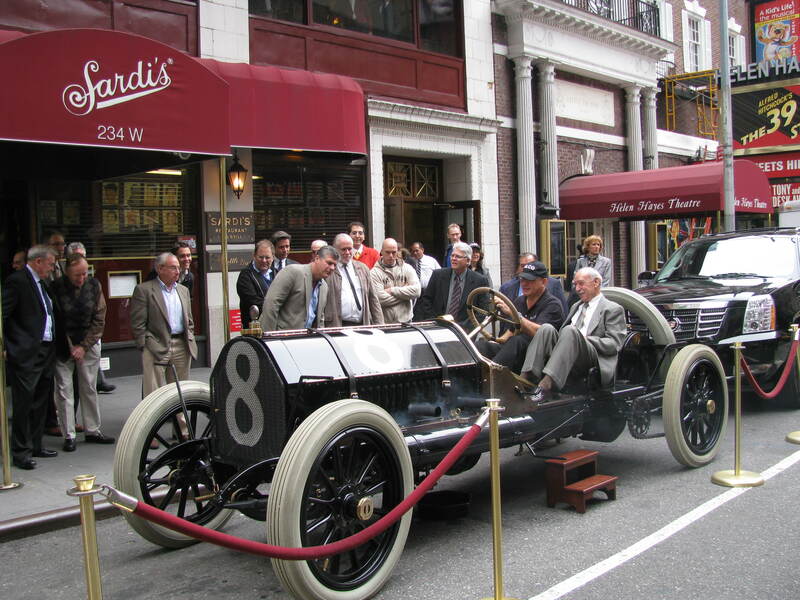 Howard Kroplick and Guy Frost in the Alco Black Beast at Sardi's in 2009. Guy and me in 2009. It was an honor for me to be included in Guy's tribute presentation. 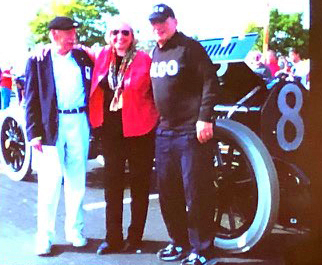 Guy Frost, Janet Guthrie and me at the 2010 Vanderbilt Cup Race Centennial. It was an honor and a real pleasure to know Guy Frost and have many conversations with him and enjoy and participate in the Centennial Celebrations of the Vanderbilt Cup Races. He was a true genuine enthusiast , a really special person. We are all so fortunate to have Guy among us in our common pursuit of long island history. Sarge and I were shocked and grieved to read of Guy’s death. Our thoughts are with Donna and their children, even as we remember with pleasure the time we spent with the Frosts in Roslyn. I, too, was a protege of the Gerrys, and met Guy in the course of that in 1972. I don’t know how many house tours and restoration projects we shared, but I will never forget how Guy would often disagree with Roger over some point or detail - and he always lived to tell the tale! Guy served on the Historic Landmarks Preservation Commission from 1992 until 2015. His invaluable expertise in historic architecture as well as his humor were an important contribution to the Commission’s decision making. He was always available to be the Commission’s eyes in the field when there were intricate details or unexpected complications at a site in construction. Wonderful man…I lived next door to Guy when I was in my 20’s. He was the best neighbor! I have many fond and fun memories… RIP my friend. I am very sorry to hear this, he was a wonderful person and an awesome car guy. Please let us know the wonderful arrangements. I knew Guy through BRRC and chowders. He was a remarkable man and passionate about the “bridge.” In fact he got me to invest in it to try to save it. The last time I spoke to him was about 20 years ago, sadly. My condolences to the family and friends. He will be missed. Nice tribute to Guy, and the turnout looks like he had a lot of friends there to confirm your nice words, Howard. He never gave up on the track as a lost cause, and its memory survives thanks to his work.